In our 50 years of experience as the bird control experts, we have acquired a great deal of information and encountered many different situations regarding bird problems. Below we would like to share some product success stories of our bird control products being used at the facilities of actual customers. You will find these success stories extremely helpful, because they are "real life" situations, described by experts in the field that have actually solved their bird infestation problems. Why effective bird control management is important! Diseases caused by pest birds. Tips for effectively using Electronic Bird Repellers. 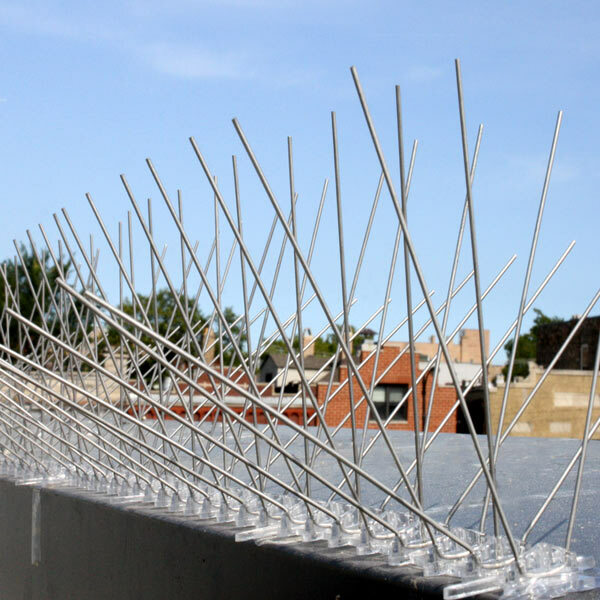 Bird Spikes eliminate roosting surfaces. Bird squadrons bomb no more: Bird Spike product keeps birds from landing on electrical fixtures at airports. Problems created by courthouse birds. Birds instinctively fly to "landing strips" such as roof ledges, windowsills, building projections, signs, statues, trusses and beams. But now you can keep them from landing on your property. It's an easy, inexpensive...and permanent bird control solution! All it takes is an application of Bird SPIKES needle strips. There's nothing like this new roost inhibitor from the world's acknowledged leader in bird pest control products. Super BirdXPeller Pro is a programmable "species-specific" bird repeller. Ideal for repelling pigeons! The new sonic bird repeller uses birds' own distress calls to create a "danger zone" - it frightens bird pests away for good and covers up to 6 acres (2.4 hectares)! 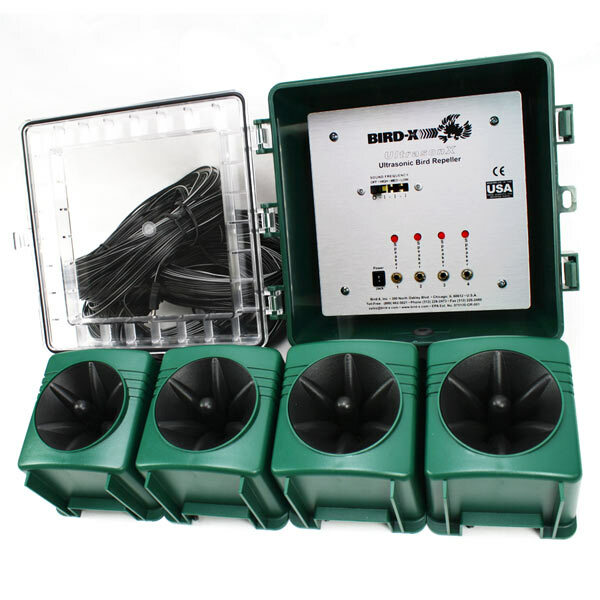 Choose from any or all of 8 sounds, including true-to-life sounds of real predators to give the birds a greater sense of danger. BroadBand Pro is a progammable species-specific bird repeller. 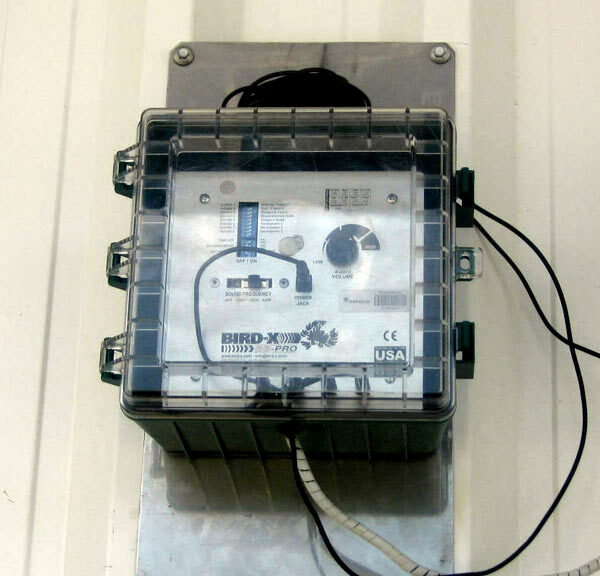 Landfill uses electronic device to deter birds from busy areas. 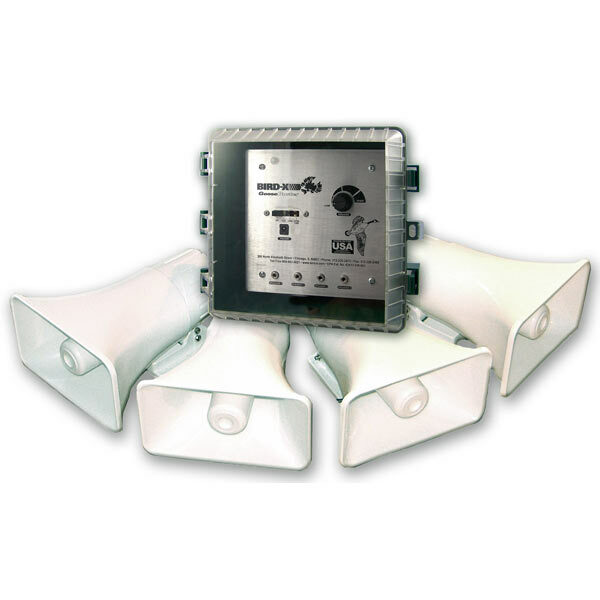 Broadband Pro is a programmable ultrasonic and sonic repeller. A unique combination of harassments creates a menacing environment that scares birds away for good. Targets pest birds with an unrelenting combination of species-specific distress cries, predators, general harassments, and newest-technology ultrasonic waves. Playing fair game: golf course rids greens of geese, eases ground maintenance. ￼GooseBuster Goose Repeller is based on decades of research by noted biologist Philip Whitford,. Dr. Whitford has obtained the only documented recording, anywhere, of the Alarm Call of Canada geese. This makes GooseBuster the foremost goose repelling mechanism in the world. 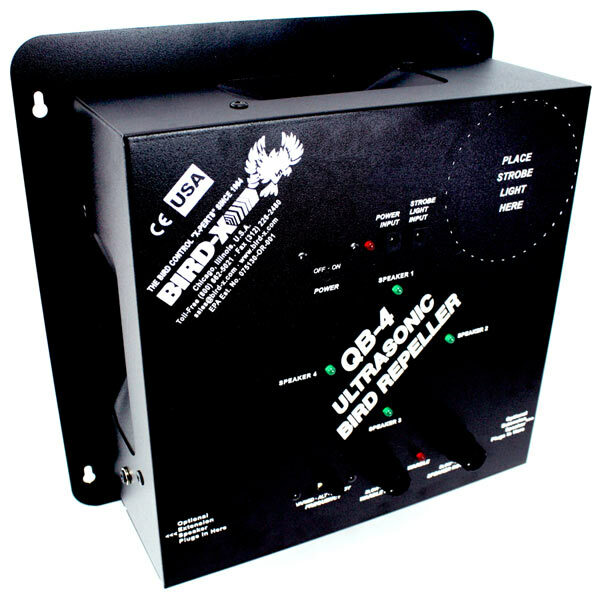 Quadblaster QB-4 is an ultrasonic bird repeller. 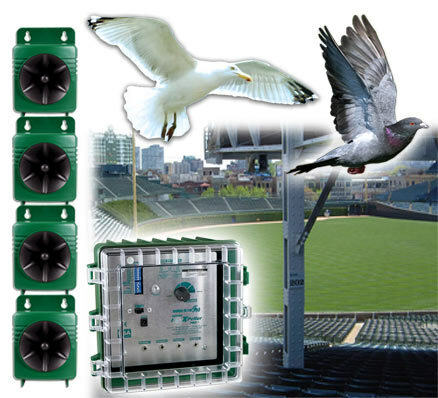 An ultrasonic unit solves the problems of pesky birds without endangering the health of the birds or employees. An ultrasonic device is being used in the hangars of Richland aviation in Masfield, Ohio, to keep the birds at bay. Overhead Door Corp.'s plant in Lewiston, PA.
Repelling birds harmlessly from municipal buildings. Invading birds were creating a respiratory and safety hazard until new equipment drove them out. Quadblaster QB-4 blast birds out with ultrasonic sounds in all directions that they can't stand and humans can't hear. 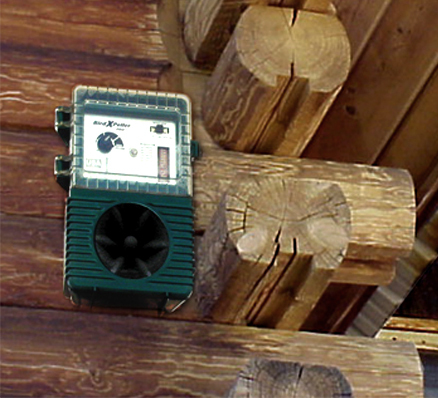 Irritating sound waves produced by the ultrasonic bird repeller are harmless to birds, but repels them aggressively in any enclosed or semi-enclosed area. Terror Eyes is a holographic visual scare device for birds. Do you have any "white poupon"?! Yellow ball with holographic, owl- like eyes scare pigeons from university's outdoor cafeteria. 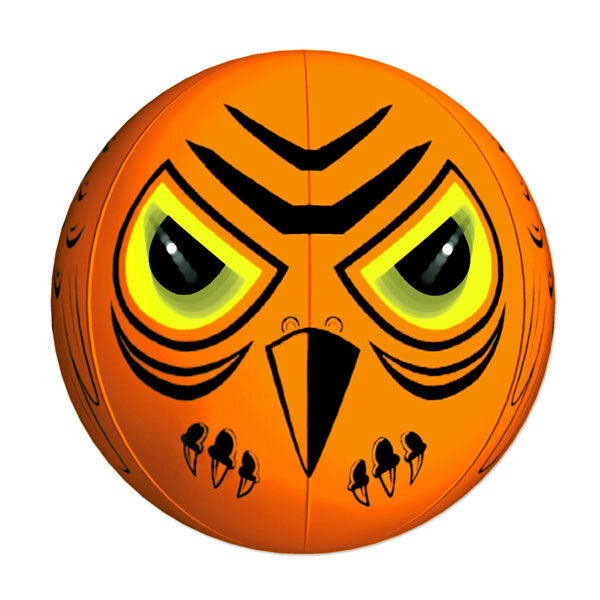 Terror Eyes Visual Bird Repeller is a huge two-foot menacing ball with eyes on front and back that move, striking fear in birds. These lenticular 3-D eyes produce holographic effects, constantly moving and changing as if they are "following" infesting birds. Hanging spring and air currents do the rest... a totally realistic and scary visual deterrent! 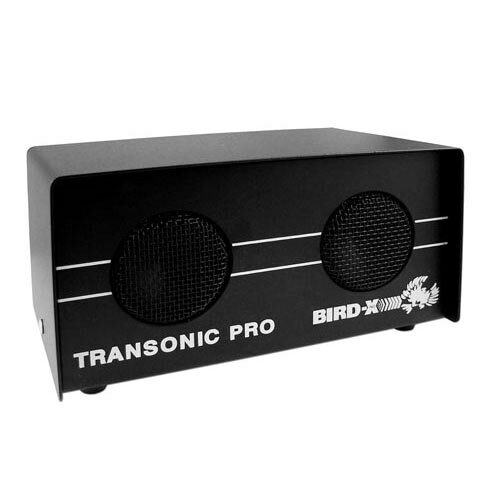 Transonic Pro - ultrasonic/sonic pest repeller for birds, bats, mice and insects. An ultrasonic repeller drives bats away from U.S. embassy building In Africa. ￼Versatile ultrasonic/sonic repeller uses variable sound output from two side-by-side speakers, ridding your premise of common pests without harming them. UltraSon X - ultrasonic pest bird repeller for exterior use. ￼Ultrason X is a programmable outdoor ultrasonic bird repeller. It's the first-ever ultrasonic bird repellent for EXTERIOR USE! Targets birds with unrelenting newest-technology ultrasonic waves delivering a constant, menacing multi-bird defense.